In this edition of Graphic Intelligence, we highlight the threat posed by post-production wells that have not yet been fully reclaimed. As the charts above show, the rise in new wells over the last two decades has created a large wave of post-production oil and gas wells – those that are no longer actively producing, but have not yet had their land fully reclaimed and returned to its original state. Although these oil and gas wells generate economic wealth during their productive lives, without adequate reclamation work post-production wells pose health and environmental risks, particularly those left in limbo at the inactive or suspended stages. Most troubling of all is the fact that bankruptcy protects many small-scale well owners from liability for cleaning up their wells, and so Alberta now has a large and growing population of “orphan” wells whose costs will fall on the energy industry and, ultimately, taxpayers in Alberta. 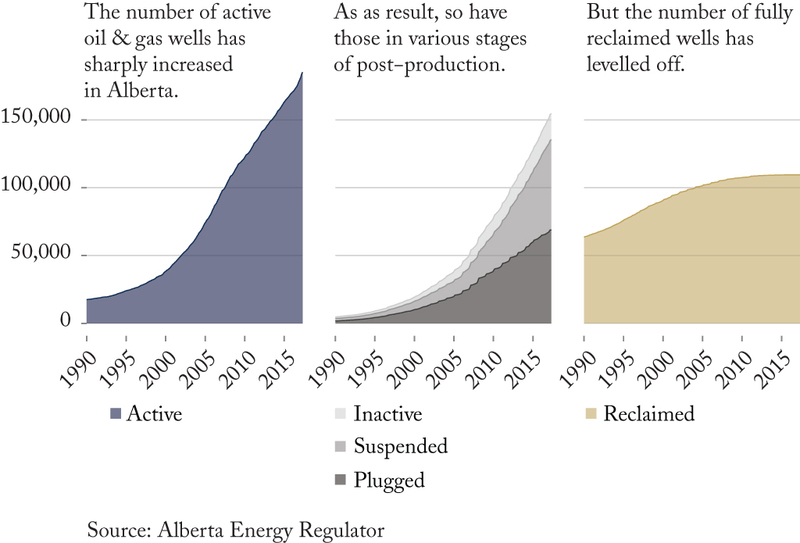 To read more about Alberta’s orphan well liability, and how it might be resolved, check out “All’s Well that Ends Well: Addressing End-of-Life Liabilities for Oil and Gas Wells" by Benjamin Dachis, Blake Shaffer and Vincent Thivierge. Aaron Jacobs is a Researcher at the C.D. Howe Institute.